Tua’s journey from his hometown in Mu Cang Chai remote mountainous district of Yen Bai Province is one of difficulties and different levels of emotion. As a reward, Tua and his classmates received full scholarship, including school fees and accommodation for their co-design school year at FUV. The FUV, one of the country’s first private, nonprofit institutions of higher education, has commenced its co-design school year with 54 students recruited from across the nation. The recruitment was conducted carefully with multiple rounds of interviews. The co-design year is one academic year when leading faculty members and staff from around the world are to be joined by the students to experience and refine Fulbright’s undergraduate programme. These 54 students will receive the FUV Founding Scholarship and be guaranteed a spot in FUV’s inaugural class in the fall of 2019. Tua was born in a poor family with six children. Tua’s parents brought them up with a small piece of field and a flock of chicken. Although they are poor, Tua’s parents pay much attention to their children’s schooling. All of their children could go to school. Graduated from primary school, Tua was one of five students of the commune winning seats at the district’s boarding junior secondary school. Most of the students at the junior secondary school were ethnic Mong minorities who regularly used their group language, thus at that time Tua’s Vietnamese was quite bad. But Tua was a good student. Graduated from the junior secondary school, he was one of four outstanding students of the district winning seats at the Viet Bac High School in Thai Nguyen city. It was also the first time Tua left his hometown to go to a city. 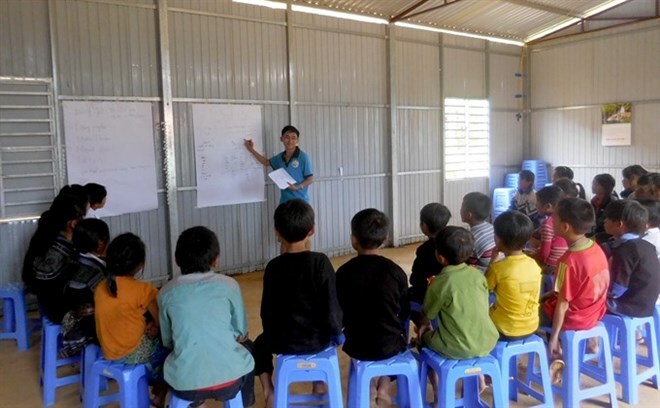 Tua quickly improved his Vietnamese after one term at his new school. When he was at grade 11, Tua won a prize at a provincial Physics competition for outstanding students. He dreamt of entering a university to escape from poverty. Tua registered to the environment faculty of the Hanoi University of Science and Technology in 2013. At that time, Tua wanted to develop tourism and economy in his hometown, as well as protect the environment. However, Tua’s house is in a remote area and his parents’ income was dependent on agricultural work, thus they did not have enough money for Tua to study in Hanoi. Moreover, Tua had brothers who were also going to school. If Tua studied in Hanoi, they might have to quit school. “Should I come back to hometown to work and go to university later?” Tua asked himself. With the thinking, when his classmates were absorbed in revising for university entrance exam, Tua packed up his personal belongings to return home. He used his savings to buy two goats with plan of raising them to earn money and helping his parents. As the day of university entrance exam came near, Tua’s teachers and parents encouraged him to take the exam. Tua passed the exam to enter the Hanoi University of Science and Technology. But during the very first days at the university, Tua found that he was not suitable to the major. He was weary and thought that going to class was his duty only, not his happiness. 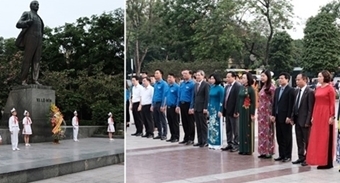 To escape from his boredom, Tua joined ethnic Mong associations with students from other universities in Hanoi and participated in their social activities. Thanks to the activities, Tua gained his joy and realised that he was not a useless man. “After one year of joining social activities, I found that I was suitable for the work, I have grown up with the work and understand what I want to do,” said Tua. Thus after two years of studying at the Hanoi University of Science and Technology, he decided to quit the school to focus on his projects of social activities. During the period 2016-18, Tua worked as coordinator of the group action for the development of the Mong community. Besides, he joined projects on Mong people’s Tet holiday, Mong people’s legend, and teaching English free of charge for ethnic minorities in Hanoi. While conducting his projects of social activities, Tua also talked about tourism’s bad effects on local residents. An enrolment worker of the FUV also attended his talk. Knowing Tua’s story, the worker encouraged Tua to apply for the FUV. Tủa’s first interview with the university was a talk about what he cared about. Tua talked about his group’s culture, what he met, what he had done. His English was not fluent enough, but he was convincing. And he was in. At this university, Tua found interest in every subject, and every exercise thanks to their openness. Tua can integrate and uphold his capacity. Speaking about his future plan, Tua said that he wanted to do some useful things for his community and village. He wanted to create an opportunity for ethnic minorities children to access to more knowledge. “Each person has a mission in life. We cannot protect children everywhere and every time, but can supply them with knowledge and skill to protect themselves,” said Tua. Seeing Tua’s achievements, many people could be surprised, but if they kept close watch on Tua’s every developing period, they would understand why he could reach success, she said. “Confidence, patience and dream bring Tua opportunity to confirm himself,” said Nga. Tua expressed his energy when he determined to pursue which he believed in, said Tram.